Today I have a special gust post by the lovely Kelsey! I'm so glad she chose to write about roommate advice because I could have used this both freshman and sophomore year! 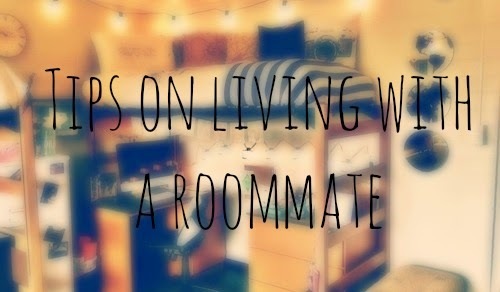 I'll tell you about my roommate experiences someday, but for now, here are hers + her advice! As we all know, it's now the month of August, which means that school has either already started for you or is going to start very soon. For me, I am going to be starting my junior year of college (oh gosh that's weird to type!). I know that many of you may already be in college or are going to start college, so I decided to do a little post on one of the infamous parts of going off to school...roommates. Not just any roommate either, but how to deal with the ones you are more than positive you won't be rooming with again! My freshman year of college, I was so keen on having a dorm on campus because it was the closest thing I could do to moving out without actually doing it! When choosing who my roommate would be, I checked the "random roommate" box since none of my friends decided to go to the same school. That ended up being a mistake on my part because even though I have all those memories now, it was not the best thing to do. Let's just go through the tips, and you'll find out what I mean! The BIGGEST thing you need to do it communicate with your new roommate! You need to either set some ground rules or make sure that you know what to do if something goes wrong. Getting each other's number is a really good idea! Another way of when communicating is needed is if your new roommate is doing something that makes you upset or uncomfortable, then you need to be able to tell him/her that. My roommate was the messiest person I met (messier than my teenage brother), but I never got the guts to say anything until the end of the school year. Every day, I would walk into the kitchen or bathroom and just see a huge mess, but I never have had the guts to say anything which in turn made living in that dorm almost miserable. You and your roommate are now going to be living in the same area for a whole year, so it is always best to get to know each other. I'm not saying that you need to be best friends (I definitely was not best friends with mine), but it's important to feel a bit more comfortable around him/her. Plus, you never know, that could be the time when you meet you new BFF! ;) When I moved in, my roommate and I just went to lunch at the commons, so when you do hang out for the first time, it doesn't have to be this big thing! Just something simple to get the ball rolling! This may sound a bit silly, but in the end, it really works! It kind of goes along with the communication tip as well. Now, when I say rules, I don't mean turn into his/her parent and try to tell him/her when to be home and such. I just mean set boundaries, such as which kitchen cabinet is yours, which sink you want, which food is yours, etc. Heck, you could even have a "rule" where you can eat each other's food, as long as you replace it! Just try to have some structure in your dorm because if you don't then your roommate's friends will come over and start using all of your drinking glasses! There you have it! There are my top three tips for roommates, and I hope you can learn from my mistakes because I wish I would have had someone to help me out like this! If you starting your first year in college or uni, then I wish you all the luck! You are now on your way to starting your dream job! :) Have a fabulous rest of your day! Happy Thursday babes…countdown to the weekend starts now!